Sitting amongst the anticipative crowd we listened attentively as the medal winners of the 2017 Golden Bean Awards were ceremoniously announced. You see, of all the coffees we submitted, our Project Raggiana Lot 1 was a very special batch of coffee for us. The reason being, the Project Ragianna coffee was not a lot purchased and roasted as per usual. 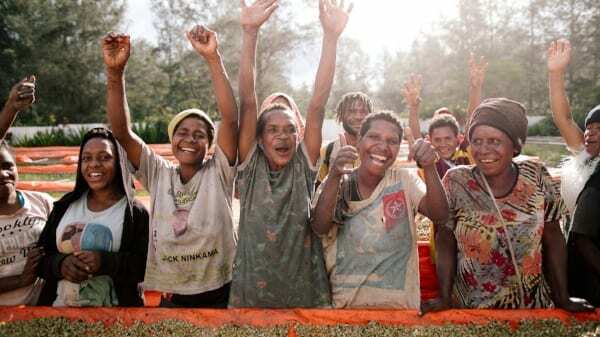 Project Raggiana coffee is the product of an innovative fermentation project designed to discover the full potential of flavour possibilities from the pacific island of Papua New Guinea. Myself and the team at Zest had designed and shepherded this particular coffee from the faraway Sigri Estate of the Wahgi Valley right to the cups of Australia’s most discerning specialty coffee judges. And as we bit our lips and wrung our hands, the announcer’s voice suddenly became music to our ears…Project Raggiana Lot 1 had scooped not just one but two medals! A silver for filter and a bronze for espresso! You can now imagine the unique sense of achievement that came with such recognition of those particular beans! Reflecting the journey of the coffee – from the historic plantations, the hardworking growers and pickers, our extensive research and experimentation, right through to the final award-winning roast in our humble Berwick roastery. This was a sweet success that rounded off a very long journey for the team at Zest. The fermentation experiment aimed to uncover the potential of PNG coffee to produce a top-tier specialty drinking experience and be a first step in a change of approach and thinking to fermentation and coffee quality in PNG. We were very lucky to have the generous support of the team from Carpenters Products for the project and all experiments were conducted at the wet mill of the renowned Sigri Estate. Fermentation, within this context, is the process in which a sticky, sugary layer of mesocarp, called mucilage is removed from the coffee seed before it is dried. It is also the process in which microorganisms, mainly bacteria and yeasts, consume sugars and produce organic acids, carbon dioxide and ethanol. The exciting part of the experiment was seeing with our own eyes and tasting with our own palates just how large of an influence you have over the final flavour of the coffee simply by controlling and designing the fermentation environment. To this day, PNG is relatively unexplored in terms of producing small lots of specifically processed coffee, which is quite remarkable because PNG has some of the most environmentally ideal coffee growing conditions on the planet. Historically, much of PNGs original coffee farms were planted with the seeds of the world-famous Jamaica Blue Mountain Typica. This variety remains the dominant coffee grown by small holders and plantations throughout the PNG Highlands. However, the biggest attraction I have with PNG coffee, is its flavours. Every now and then, our sensory team will hold a cupping of PNG samples, which reveal rare yet jaw-dropping flavours, such as jellybean-like sweetness, and a unique sparkling acidity. It was the lure of these tasting experiences that planted the initial seed in our minds to venture to the remote highlands of PNG and explore the flavour possibilities. Despite PNG’s close proximity to Australia, the overarching reason the country has remained relatively unexplored in terms of specialty micro-lots is because the Papua New Guinean people have a strong culture of tribal warfare, which can create a security risk for foreign travellers. During our visit we didn’t encounter any negative or dangerous situations, but we did make a very active effort not to be in the wrong place at the wrong time. The aim of our fermentation experiment and the Project Raggiana micro-lots was not only to produce coffee from carefully selected, ripe Typica cherry, but to push the boundaries and really understand the impact of controlled, low-oxygen fermentation on the coffee flavour profile. By boundaries, I’m talking about time spent fermenting as well as the degree of pH (potential of hydrogen) reached before washing the coffee and ending the fermentation. Basically, we wanted to determine how long and how low the pH could go before things went sour. In planning the experiment, we consulted coffee fermentation experts in both Colombian and Brazil, and learned that a low-oxygen environment would slow the metabolite rate of fermentation and allow more scope for flavour creation. We also learned that a low oxygen environment enables a desired microbial community to become dominant. This dominant community has a strong correlation with great tasting, fruity cups with a high lactic acidity. Our fermentation protocol was to monitor the pH, Brix sugar content, and temperature of each of the fermentations three to four times a day. From this information, we could map the metabolic rate and better understand the different stages of the fermentation as well as correlate our tasting experience with different lots and finally, hypothesise the causal flavour impacts of fermenting for longer times or to different levels of pH. For the fermentations we used sealable, food grade plastic rainwater tanks. Once a lot was complete, we either transferred the coffee directly to the raised beds to dry as a quasi-honey process, or washed the coffee before taking it to the drying beds, which is the norm for PNG. From the most recent harvest, we produced six Raggiana micro-lots in total. The element that distinguishes the six lots is the fermentation times of which the lots are named. The times range between 60 and 100 hours and, to our great surprise, each lot is distinctly unique and presents with flavours showing little or no continuity to the taste of other lots. Lot 1, which was the lot we entered in the Golden Bean roasting competition, was fermented for 65 hours and boasts a flavour profile of lavender, apple, cherry and concentrated tropical fruit juice. Coffee wasn’t the only thing we produced in PNG. We also captured an enduring cinematic memory of the whole journey. We came home with a dynamic cinematic short film documenting the journey. Andrew Northover of The View From Here is one amazingly talented videographer who also braved the wilds of PNG to produce Project Raggiana – The Film. Satisfying our resolve to share every wonderful aspect of specialty coffee with coffee lovers the world over, this short film is accessible to anyone and everyone. And of course, the awards, they were the icing on the cake. Project Raggiana Lot 1, was awarded a silver medal in the filter category and a bronze for espresso. There is no better outcome for myself and the team at Zest than to have our efforts realised and recognised through the Golden Bean platform.